We carry a variety of styles and sizes of golf umbrellas. Please see each specific product description for details. 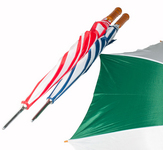 For customized Golf Umbrellas, please see our Customized Rain Umbrellas section.